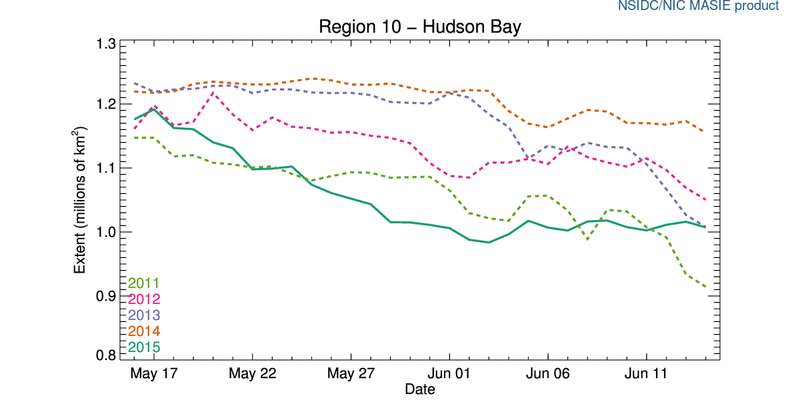 Sea ice coverage for Hudson Bay on 14 June converged on levels recorded in 2013, when breakup was slightly later than the average of the last two decades. There is also more ice over Hudson Bay than there was in 2011, which was an early breakup year (charts for other Arctic regions here, originals here). Andrew Derocher notes (via twitter) that rather than heading to shore, most of the Hudson Bay bears with satellite tracking collars (7/10) are out on the ice (Fig. 1 below). They appear to be hunting along the ice edge, where they are most likely to find seals. Update 17 June 2015: Sea ice images for the week 18 June 2015 compared to other years added below, for Hudson Bay and the Beaufort Sea. 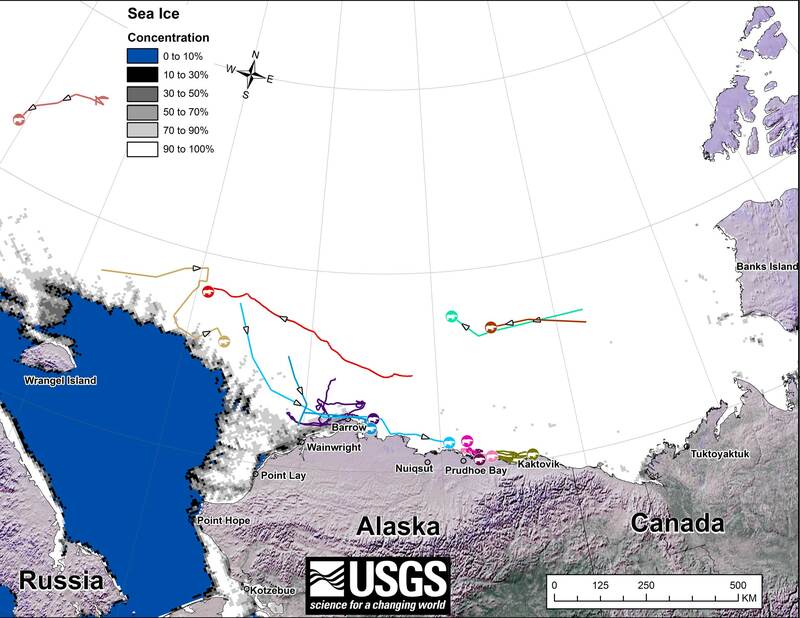 USGS biologists were clearly busy this spring putting more satellite radio collars and glue-on tags on Southern Beaufort Sea polar bears but there’s some surprising information in their April 2015 tracking map about current sea ice conditions. 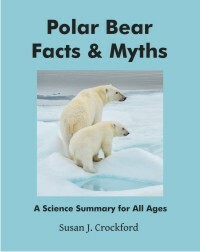 From the 2013-2014 issue of “Polar Bear News” (USFWS). What’s interesting is that the sea ice maps they use show less dark spots that might be open water this year than were present last year in late April. 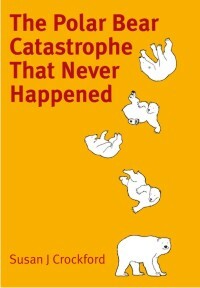 Oddly, this phenomenon has one prominent biologist worried about “challenging” polar bear habitat developing this year – without mentioning last year at all. See that post for methods and other background on this topic, and some track maps from 2012 (also available at the USGS website here). The USGS track map for March 2015 is copied below. See that post for methods and other background on this topic, and some track maps from 2012 (also available at the USGS website here). The USGS track map for February 2015 is copied below. There were 7 bears in February, up from 6 in January, because one of the bears has re-entered the area from elsewhere. However, many bears from the original sample have either had their collars fail, moved out of the area and stayed out, or they have died. We can’t tell from which of those options, or combinations of them, explain the reduced number still being followed. See that post for methods and other background on this topic, and some track maps from 2012 (also available at the USGS website here). The USGS track map for January is copied below. There are only 6 bears being followed now, which means a few more collars have failed, or the bears have moved out of the area or died. See that post for methods and other background on this topic, and some track maps from 2012 (also available at the USGS website here). The USGS track map for December is copied below. There are only 10 bears being followed now, which means a few more collars have failed, or the bears have moved out of the area or died. See that post for methods and other background on this topic, and some track maps from 2012 (also available at the USGS website here). The USGS track map for November 2014 is copied below. 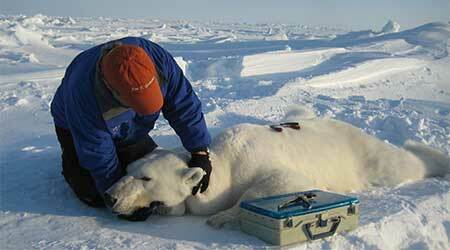 Original caption: “Movements of 12 satellite-tagged polar bears for the month of November, 2014. 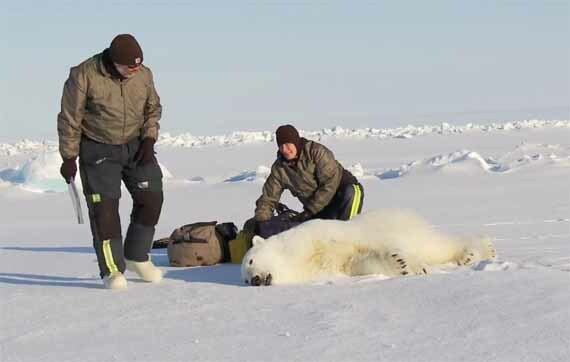 Polar bears were tagged in 2014 on the spring-time sea ice of the southern Beaufort Sea. All twelve of these bears have satellite collar transmitters. 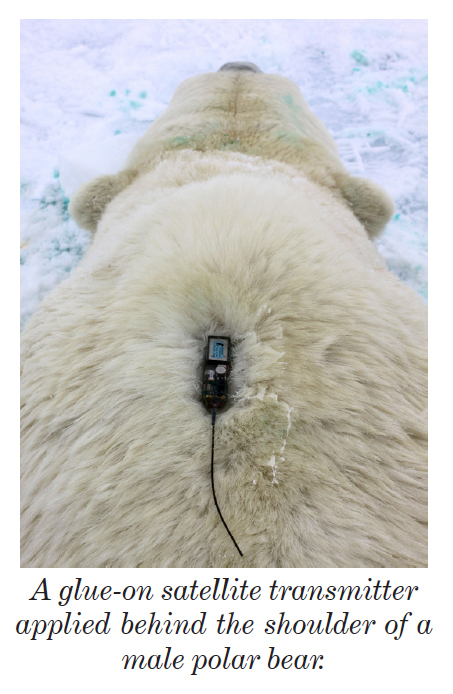 Polar bear satellite telemetry data are shown with AMSR2 remotely-sensed ice coverage for 30 November, 2014.” Click to enlarge, original here. All twelve bears (all females) are finally visible on this map, confirming my suspicion that two were so close together they overlapped. 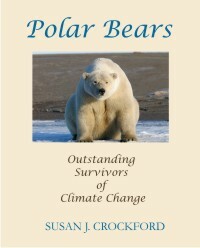 Three out of the twelve “Southern Beaufort” bears were in the Chukchi Sea at the end of November (west of Point Lay, see discussion here). If you missed it, my October 2014 post on the progress of these bears has some maps from previous years that are worth reviewing.